Ideal for building upper and lower body strength for rehabilitation or fitness. Whether building strength after shoulder or knee surgery or improving athletic performance, our bands, tubing and corresponding resistance exercise programs can be easily and economically used for any exercise program. The progressive resistance of our products parallels the basic concepts of building strength and mobility. As each level is mastered, the resistance can be increased with ability. In general, tan and yellow are used for early rehabilitation or very frail individuals. The most common resistances are red, green & blue. Black, silver and gold are typically used by athletes. The use of elastic resistance rather than weight-bearing exercises minimizes pressure on the joints and decreases the possibility of incurring other injuries. They can be used while traveling, sitting at home or even in the office. 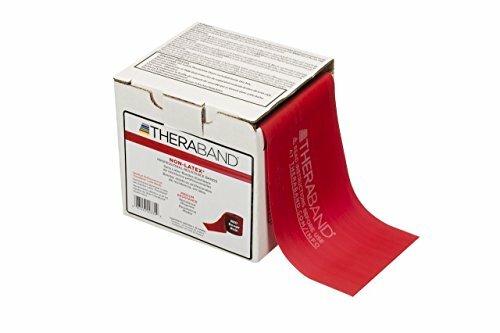 Uses for the Thera-Band Bands include: exercise, gym, balance, fitness, birthing, yoga, pilates, and stability and resistance. DR-HO'S ® Pain Therapy System Pro Ultimate Package TENS Machine Unit (Black)- 24 Small pads, 6 Large pads, 1 pair of Travel Foot Therapy Pads, Pain Therapy Back Relief Belt & more.